Kodak Is Making Android Phones Now Because Sure, Why Not I Guess? Kodak's about to have its own line of Android phones now, because sure. The company—now little more than a name to be slapped on products from all kinds of no-name manufacturers— will be showing off its first Android devices at CES in just over a week. [Kodak] will launch a range of Android-powered mobile devices offering best-in-class image management software and features along with great design and UI. 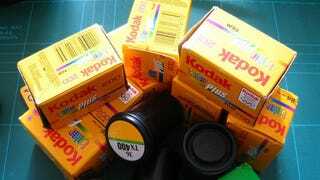 Kodak's new devices— a 4G handset, a tablet, and a connected camera—will actually be made by Bullitt Group, while the Kodak company provides the name and caché. Bullitt's in a similar relationship with Caterpillar, which has a line of rugged Android devices.